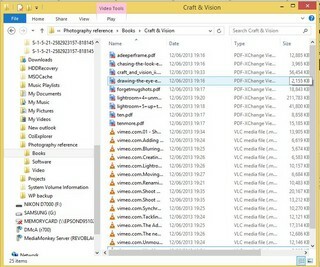 Quick (genuine) tip here – a super fast way to change the view you see when looking at files in Windows 8. I often open Window 8 File Explorer, and bafflingly find myself looking at icons of the files, instead of the details view, where I can sort by date and time and size and so on and so forth. Despite my setting the Explorer preferences for details, Windows 8 keeps returning me to the almost useless icon view that you can see in the thumbnail above. The only way to change it is to mouse click on ‘view’ and then ‘details’, which is tedious and takes your hand off the keyboard for a trivial operation. 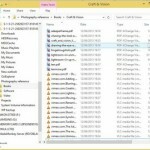 Microsoft have a very long list of keyboard shortcuts for Windows 8, but these don’t include anything for changing the file view. A more detailed search on the internet however has turned up the following excellent set of shortcuts, which to my amazement actually work. Using them you can flip instantly from one view to the other. The tip comes from Ricardo Bohner, and he deserves a medal.